Real and Fake Enemies of Fascism. Article originally published in the Greek newspaper "Alithines Eidiseis", republished on 902.gr / Translation: In Defense of Communism. 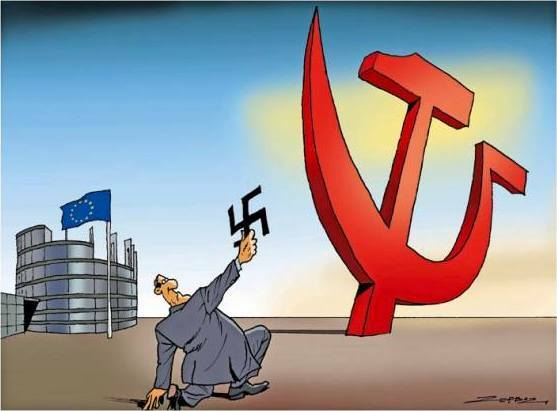 The deepest objective of the EU's provocative anticommunist campaign is to persuade the peoples that there is no way out from the current swamp of the capitalist system, exploitation, insecurity, unemployment. History has irrevocably illuminated that the capitalist system gives birth to fascism stream and uses it multiformally in order to strengthen the dictatorship of the capital. That is why the bourgeois democracies of France and Britain supported the expansionist and anti-Soviet plans of Nazi Germany, with a top example being the Munich agreement. That is why the bourgeois democracy of Germany, which drowned the socialist revolution in blood, opened the way for Chanchellary to Hitler. Today's praisers of the Estonian SS battalions cannot erase the decisive contribution of the Red Army and the 20 million dead people of the USSR in the peoples' antifascist victory. They cannot hide that only the communists struggle to overthrow the system that generates fascism. They cannot hide that the dictatorship of the capital- with the form of bourgeois democracy too- is dipped in the blood of imperialist interventions from Vietnam to Iraq, of occupational accidents-crimes, of impoverishment. They cannot conceal the two real edges of society which have opposing class interests- the working class and the ruling class of the capitalists. The stronger the attack against the rights and the achievements of the people becomes, the stronger the anticommunist campaign will be. This policy is decisively promoted the current government of SYRIZA, as a willing bearer of the EU flag, of NATO and the domestic bourgeoisie. The same antipeople policy is supported by New Democracy, which in order to differentiate itself, now competes with the vulgar anticommunism of Golden Dawn. There is a way out for the people, as long as it targets the real opponent, the ruling class, and to organize its counterattack. The road opened by the October Revolution, with its positive and negative experience, proves that the dictatorship of the capital is not the end of history. * Member of the Political Bureau of the CC of the Communist Party of Greece (KKE).